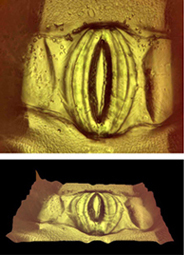 Stomata are of great interest for a variety of reasons. 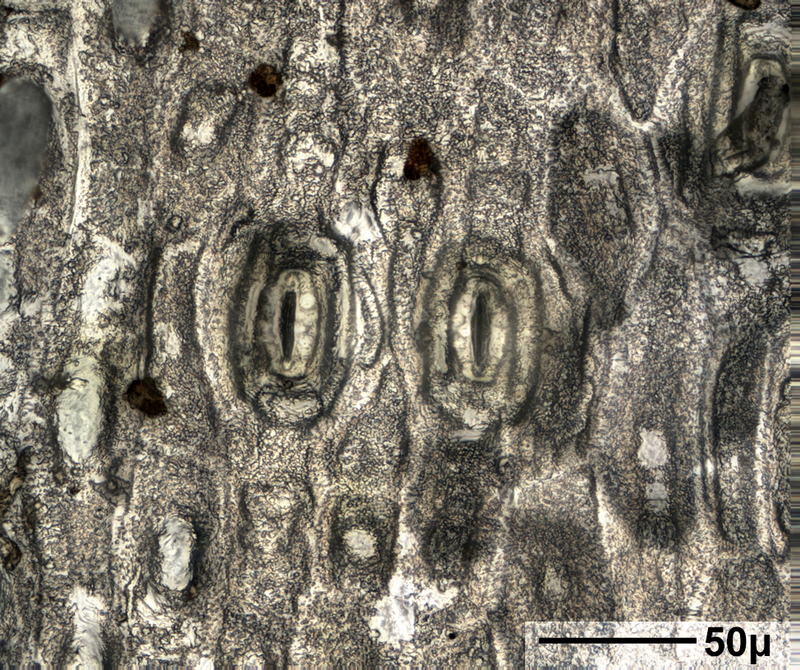 Some scientists are comparing stomata in recent and fossil leaves in order to better understand the importance of global warming1, 2. 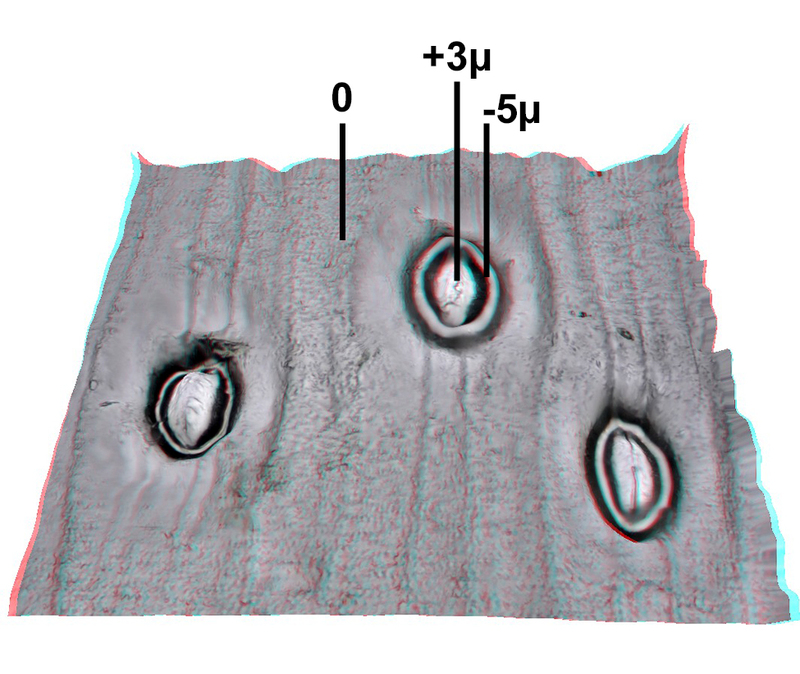 Others propose manipulating stomatal function using combinations of physiological and molecular genetic methods in order to improve water use efficiency of plants.3 This is especially important in the case of droughts. 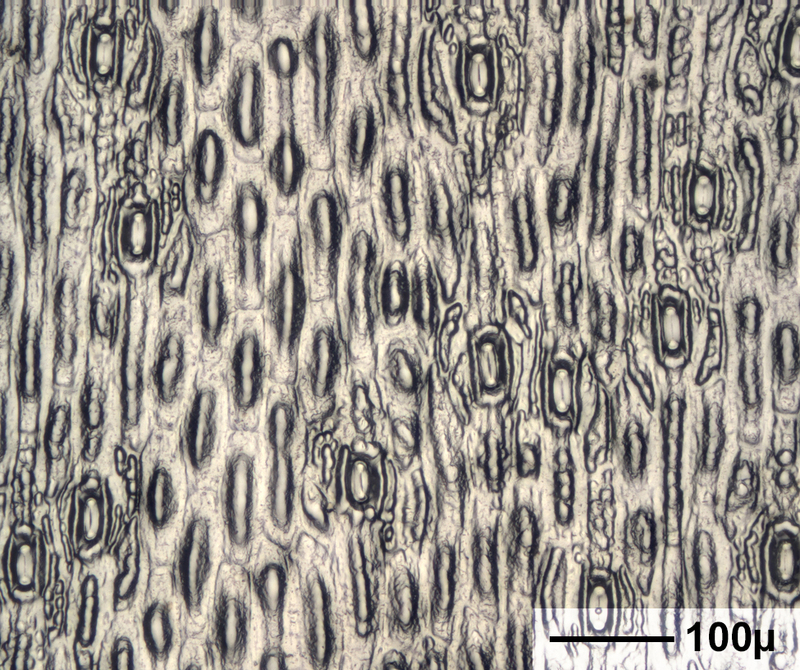 Plants are classified by the sizes, shapes, arrangements, and densities of stomata on leaves.4 Understanding the role and behavior of stomata provides guidance that can lead to improvements in foliar (leaf-applied) fertilization.5 The study of stomatal physiology can help in the discovery of new strategies to prevent pathogens from entering leaves.6 The locations of stomata on leaves can reduce water loss that can lead to fire risk. 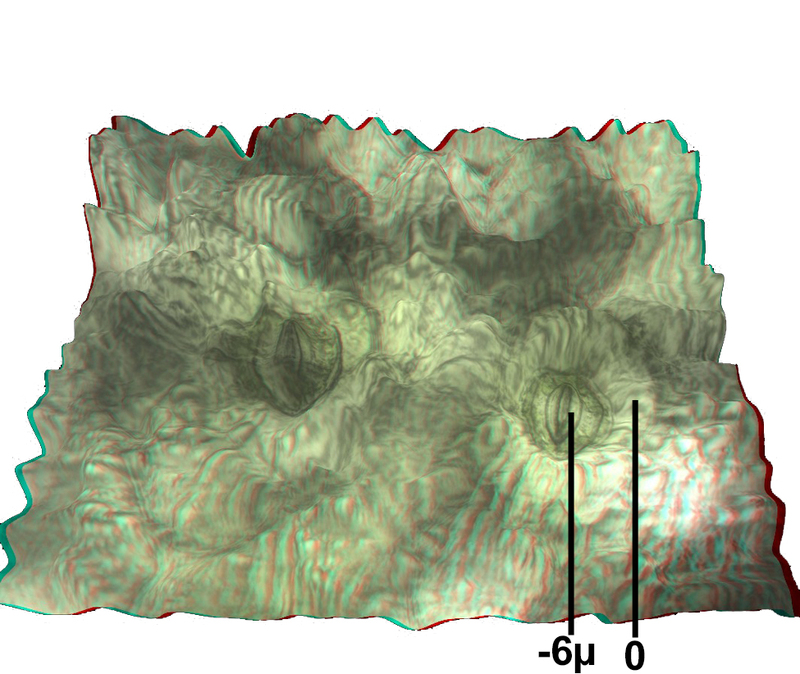 This can lead to planting of certain kinds of trees in forested areas that are subject to periodic wildfires.7 Detailed microtopographic images like those below can provide guidance for these and other purposes. Stomata are found on the upper and lower sides of leaves, on flower petals, stems, and on roots. 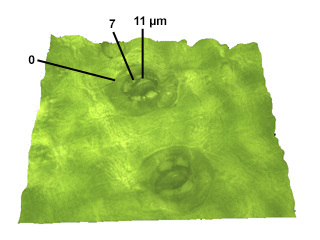 Scientists survey plant surfaces to determine the density and size of stomata and relate these findings to properties of the environment, such as the temperature and amounts of sunlight, humidity, oxygen and carbon dioxide in the air when a leaf is formed. 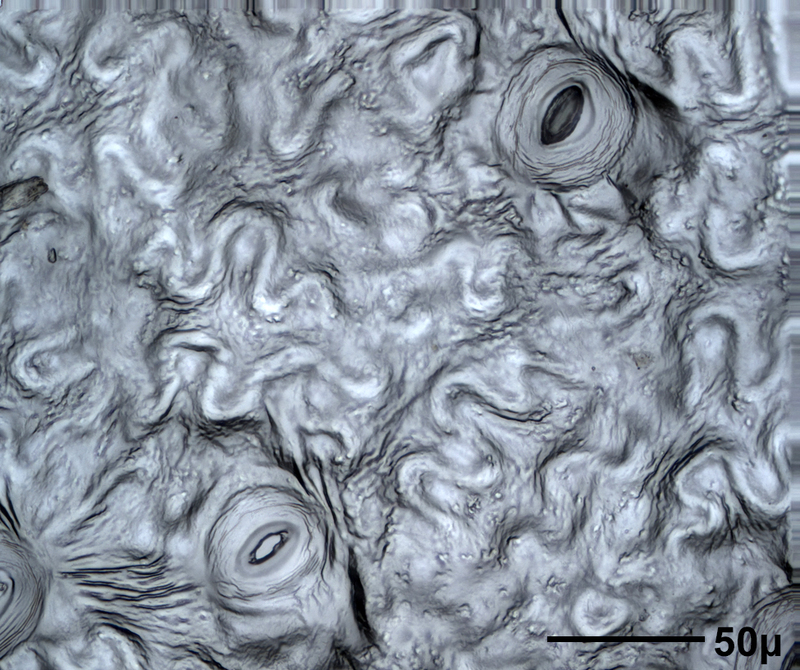 Leaves of terrestrial plants generally have more stomata on their undersides. 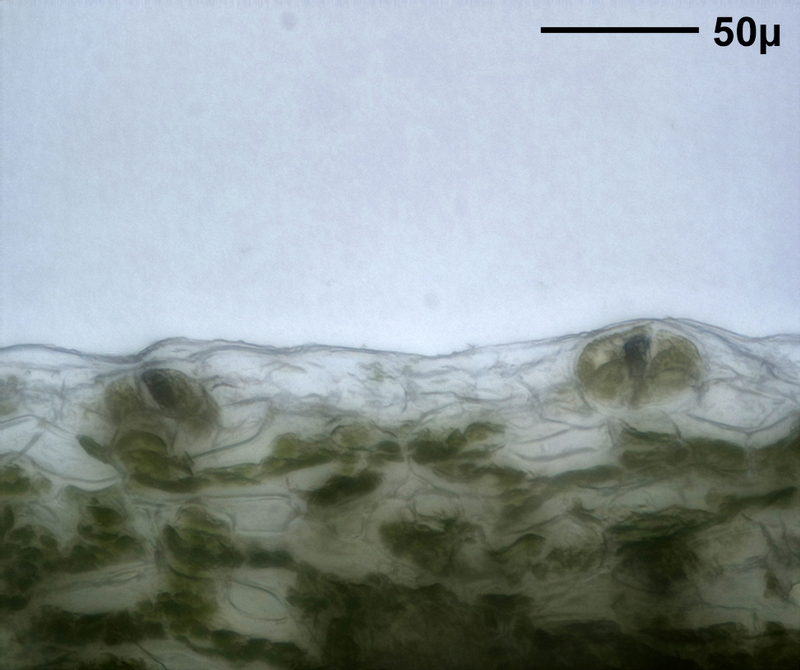 Floating leaves of aquatic plants generally have stomata only on their upper surfaces while some underwater plants have no stomata at all. 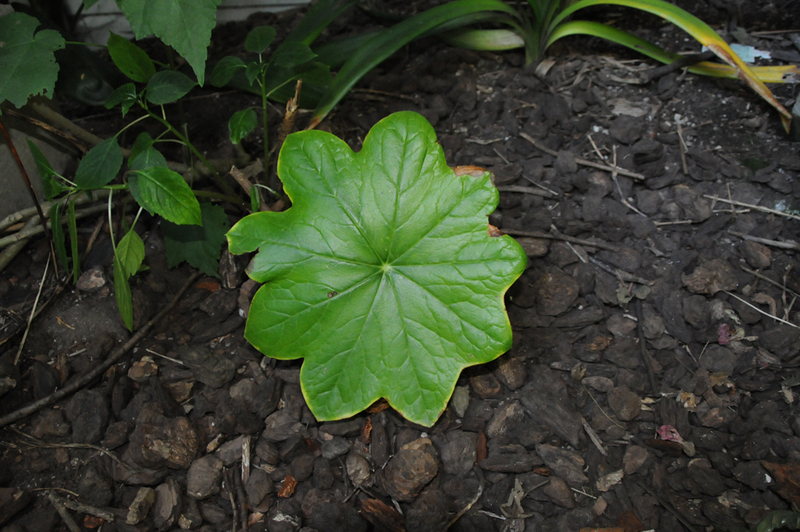 The seeds of monocots (grasses, bulbs) have a single embryonic leaf or cotyledon. 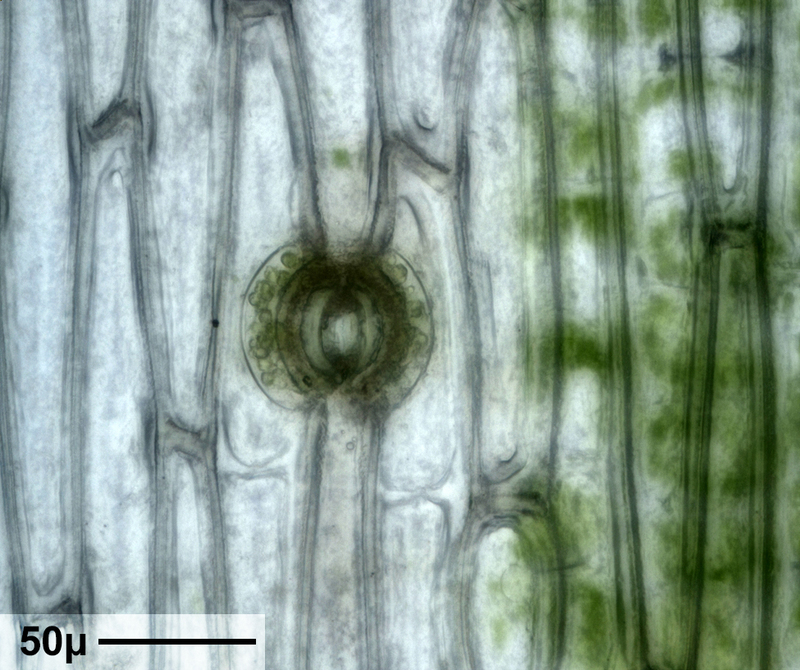 The major veins in monocots are parallel to the leaf axis. 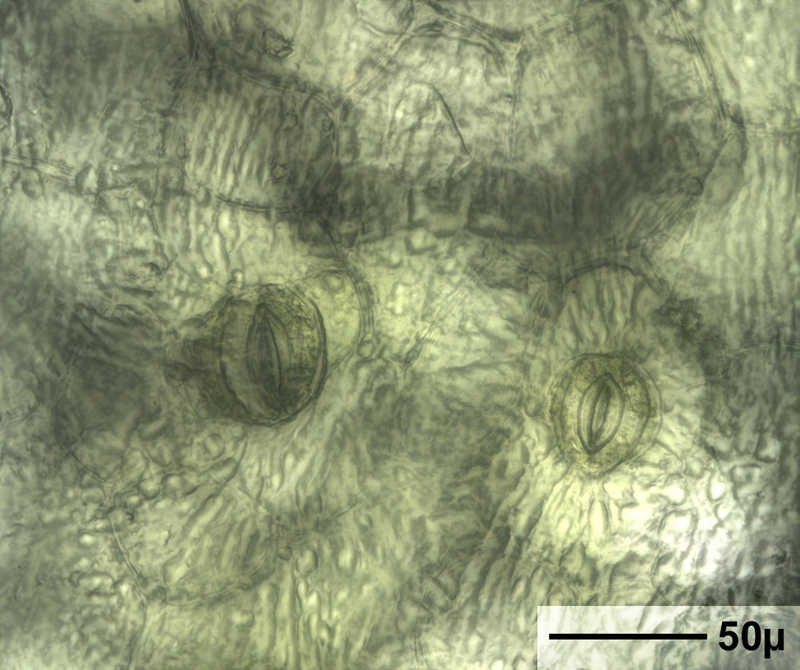 Their stomata are generally oriented similarly to one-another. 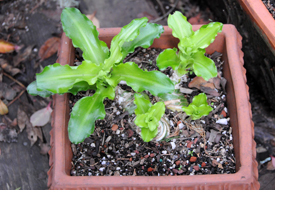 Dicot seeds (oak trees, roses) have two embryonic leaves. 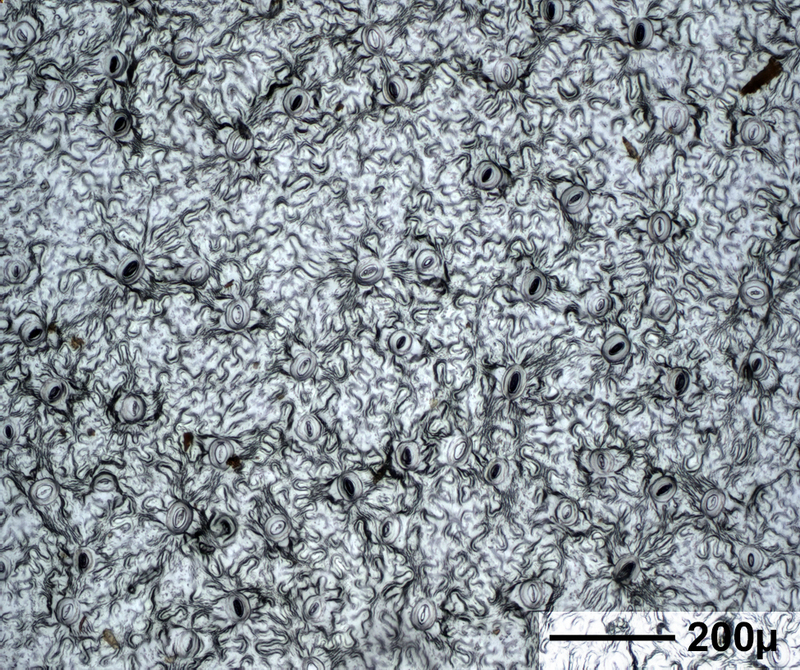 Their leaf veins are in net-like arrangements. 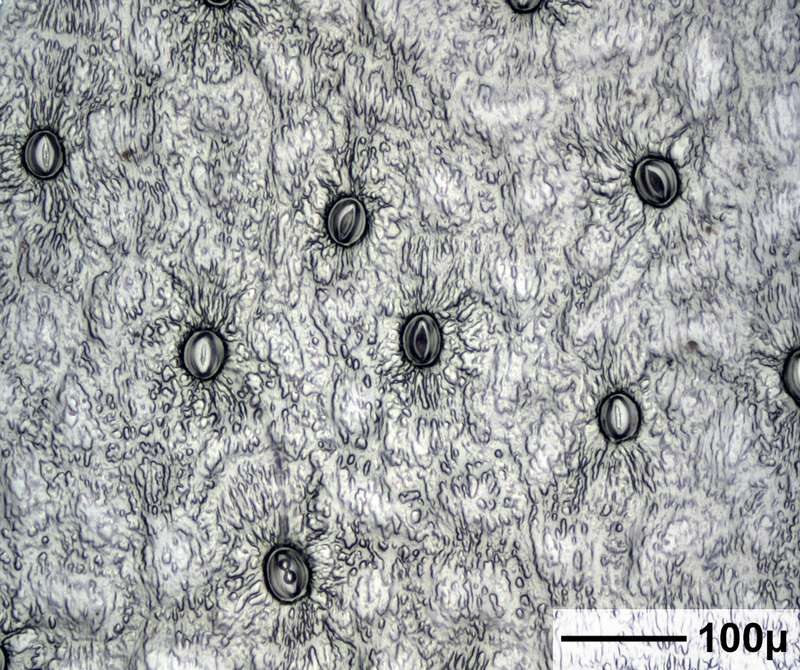 They have stomata that are randomly oriented. 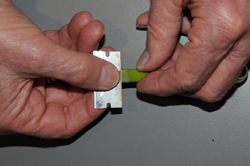 These differences are seen in the images below. 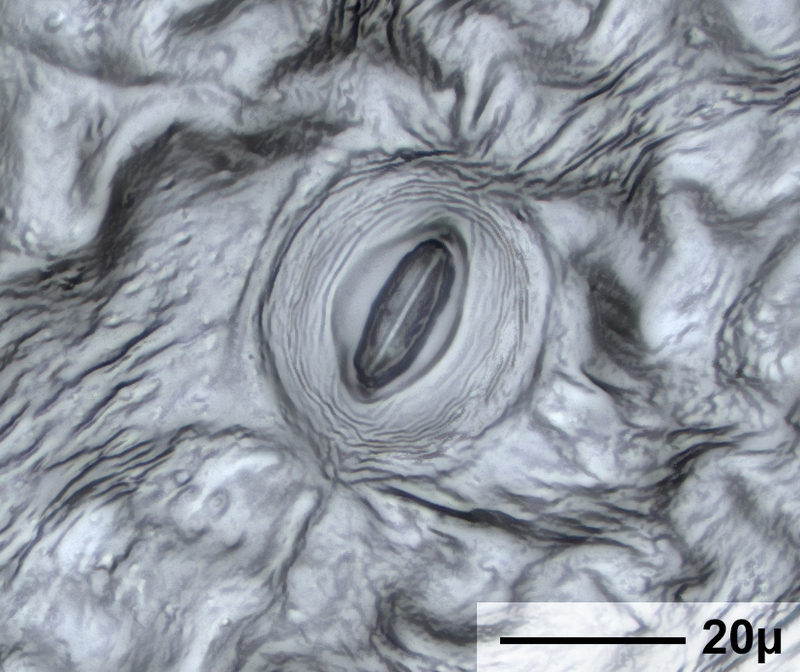 *See the accompanying article in Microscopy Today here. 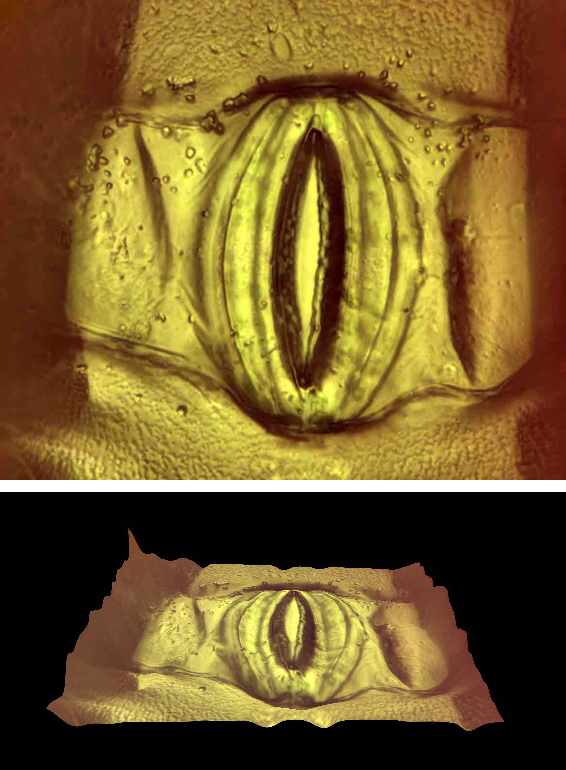 A Nikon Eclipse LV100 microscope and a Point Grey Grasshopper camera were used. Koehler illumination was used throughout. 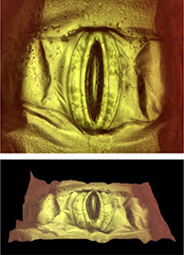 Image processing and focus stacking software were used where appropriate. Each set of images includes a picture of a plant, magnified views of stomata, a stereo close-up, a dynamic perspective view, and a cross-sectional view of a stoma. 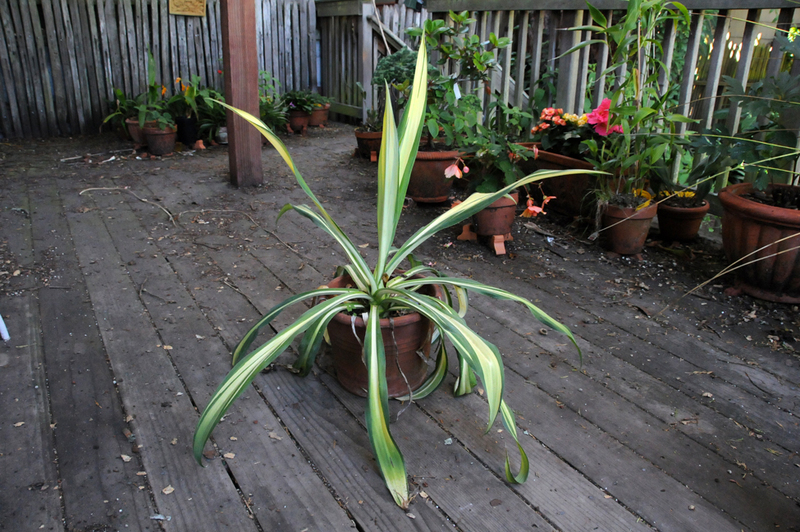 The plants shown here all grow in San Francisco, California. 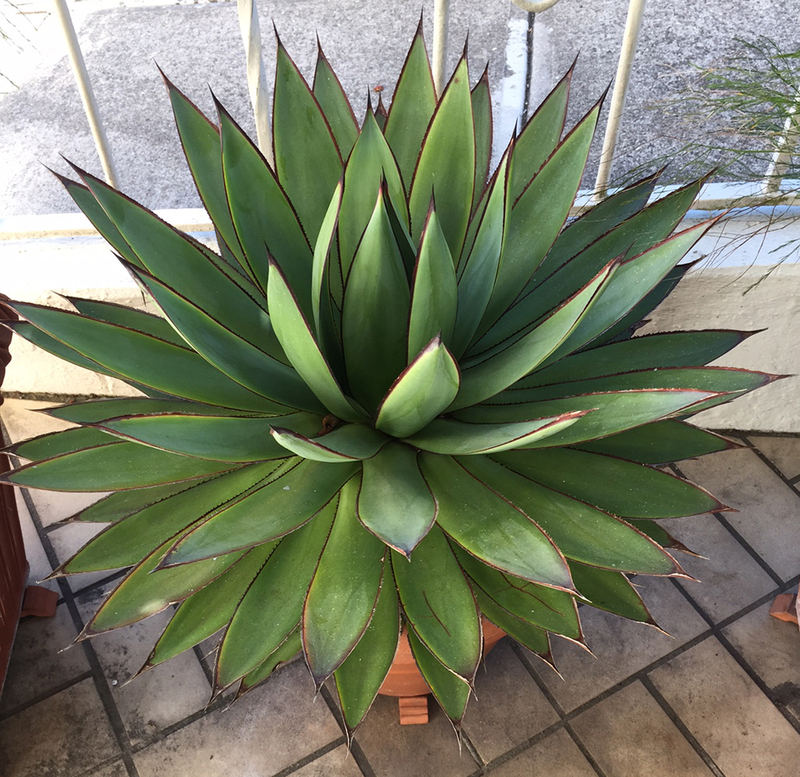 Agave 'Blue Glow' is a succulent, monocarpic monocot. 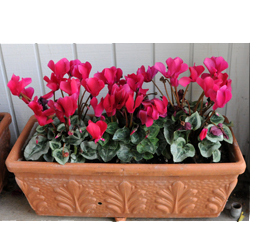 The leaf axis is vertical in these images. 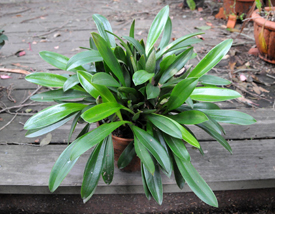 B. yuccoides is a succulent monocot in the family Asparagaceae, subfamily Agavoideae. 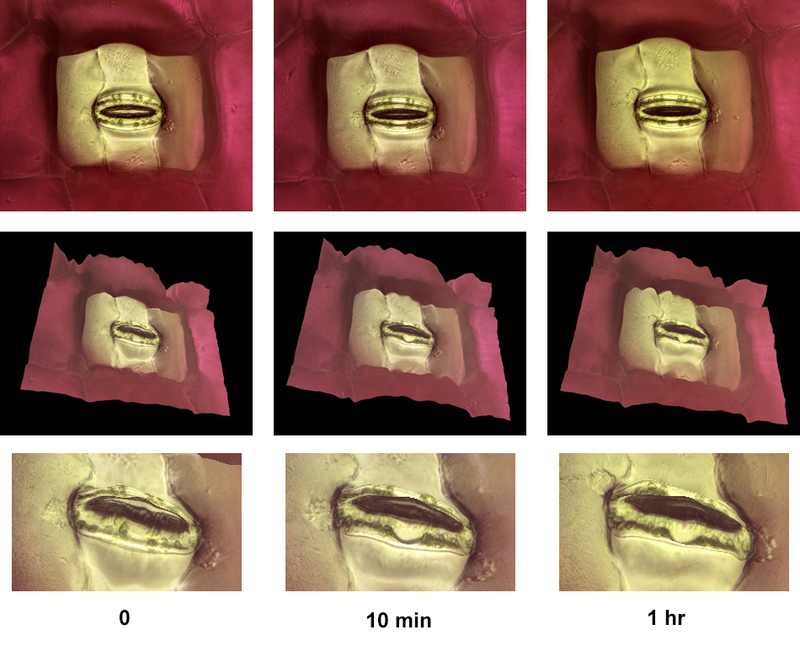 The leaf axis is vertical in these images. 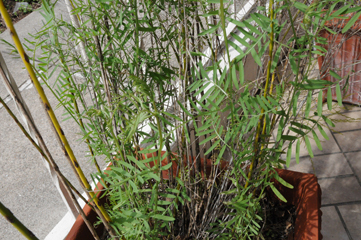 P. pleianthum is an herbaceous perennial dicot. Masdevallia Highland Monarch 'Golden Sunshine'. 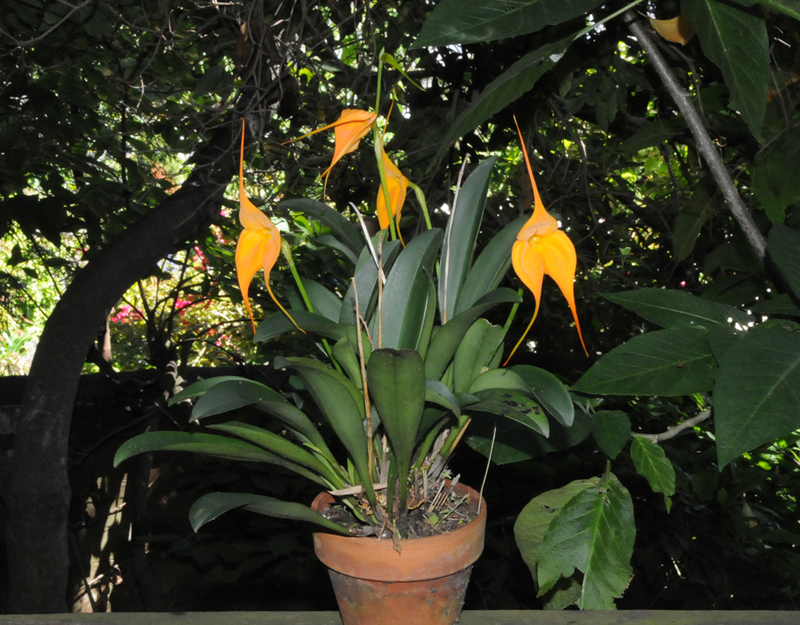 Masdevallia Highland Monarch 'Golden Sunshine' is a monocot. 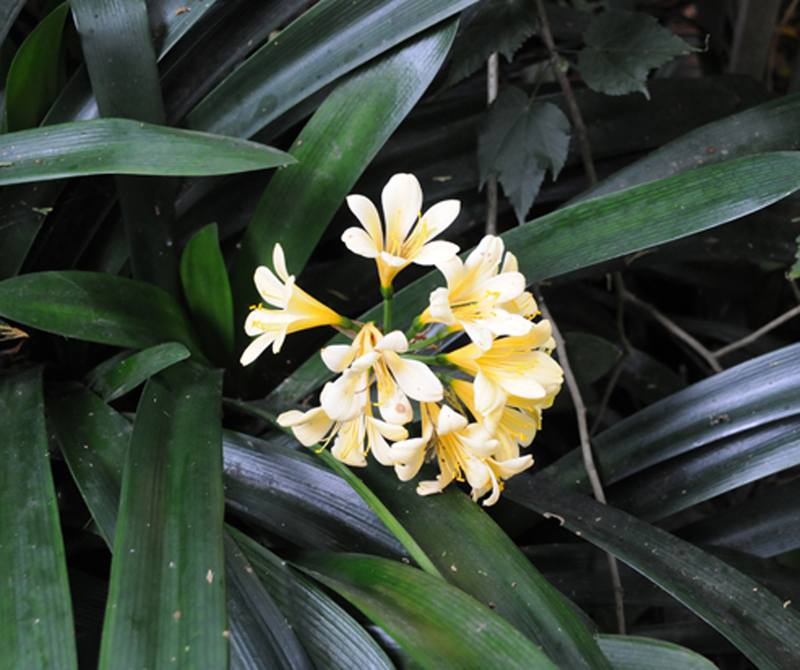 C. miniata is a monocot. 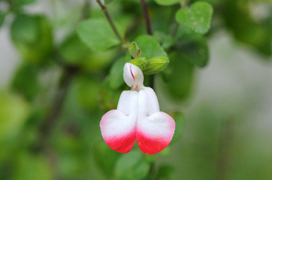 The leaf axis is vertical in these images. 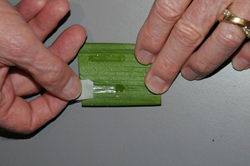 In the images below, a leaf specimen was studied as soon as possible after a leaf was removed from a plant. 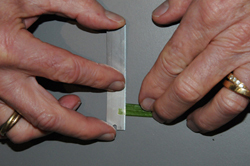 Stomata begin closing very quickly after a leaf is cut. 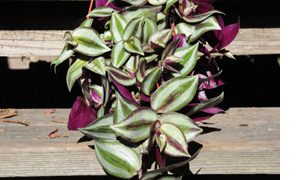 This is an 8 minute time-lapse video of a closing stoma on a Tradescantia zebrina leaf. 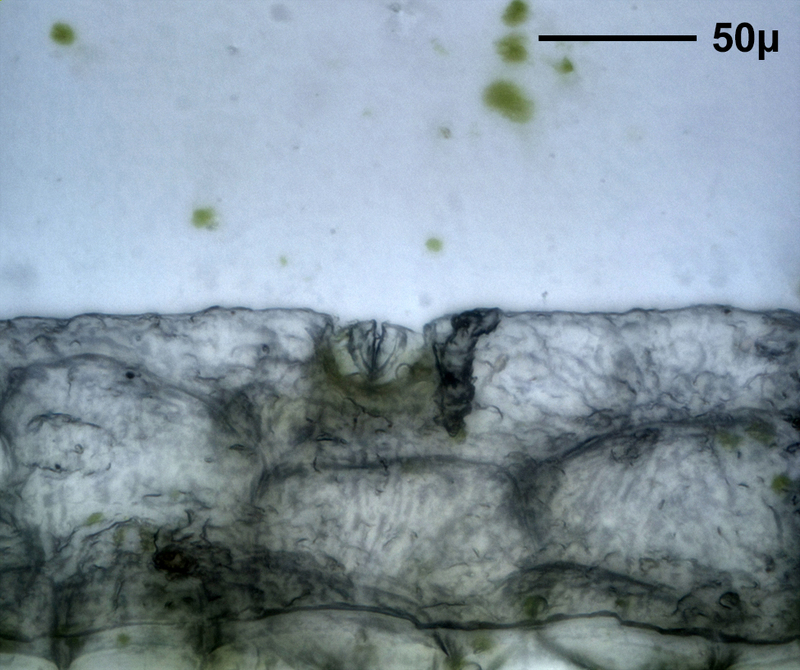 Image width is 250 microns. An image was taken every 2 minutes. The sequence reverses half way through the video. 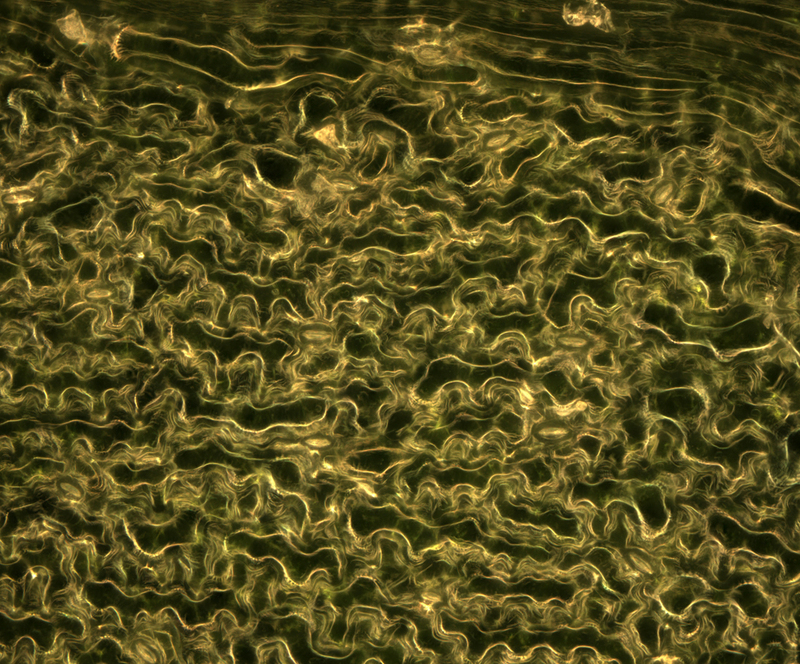 This is a 14 minute time-lapse video of closing stomata on a Salvia microphylla leaf. 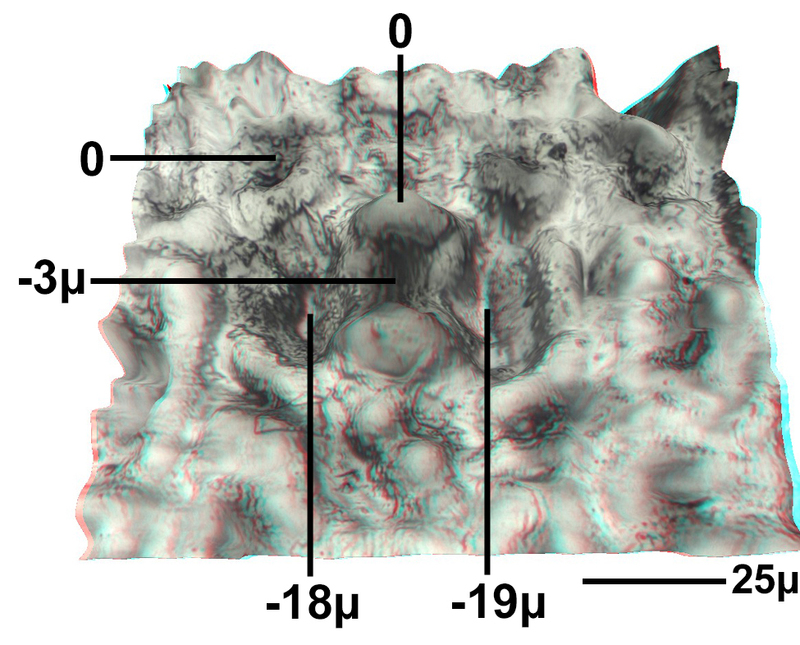 Image width is 622 microns. An image was taken every 2 minutes. 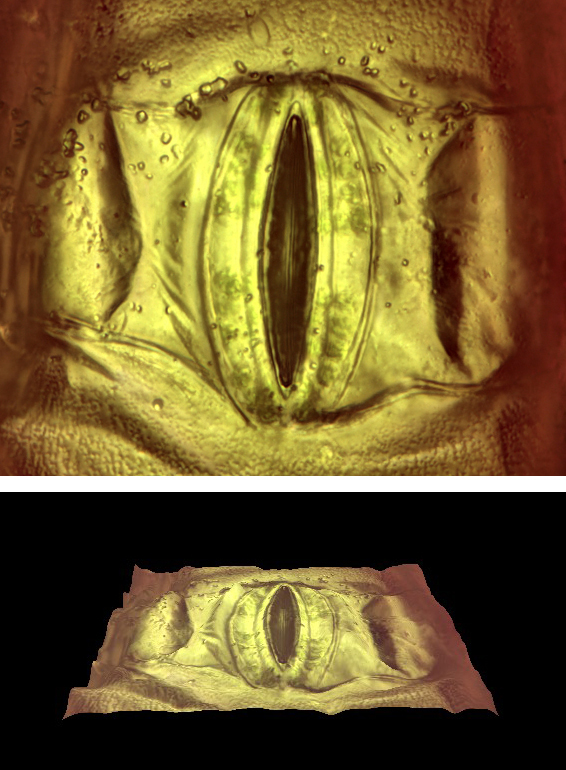 This is a 2.5 hour time-lapse video of closing stomata on a Cyclamen leaf. 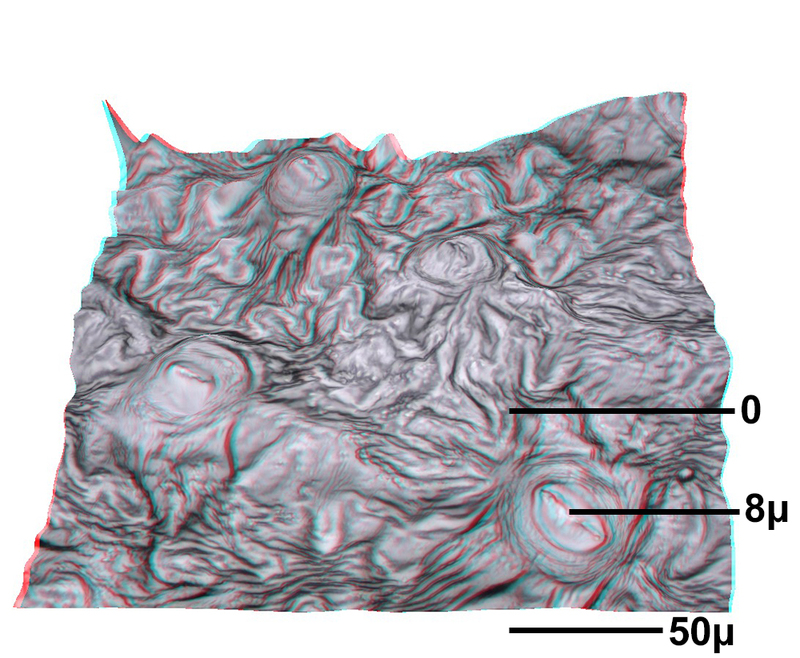 Image width is approximately 220 microns. An image was taken every 6 minutes. 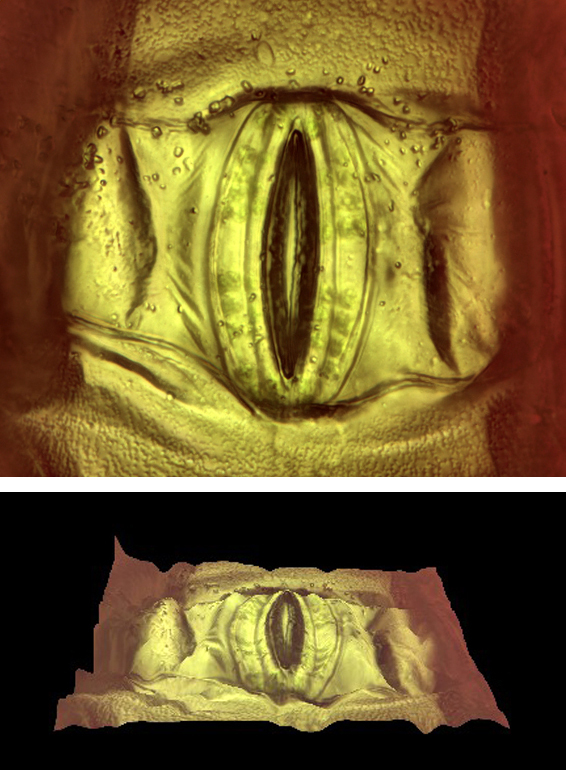 This is a 1.75 hour time-lapse video of a closing stoma on a Masdevallia leaf. 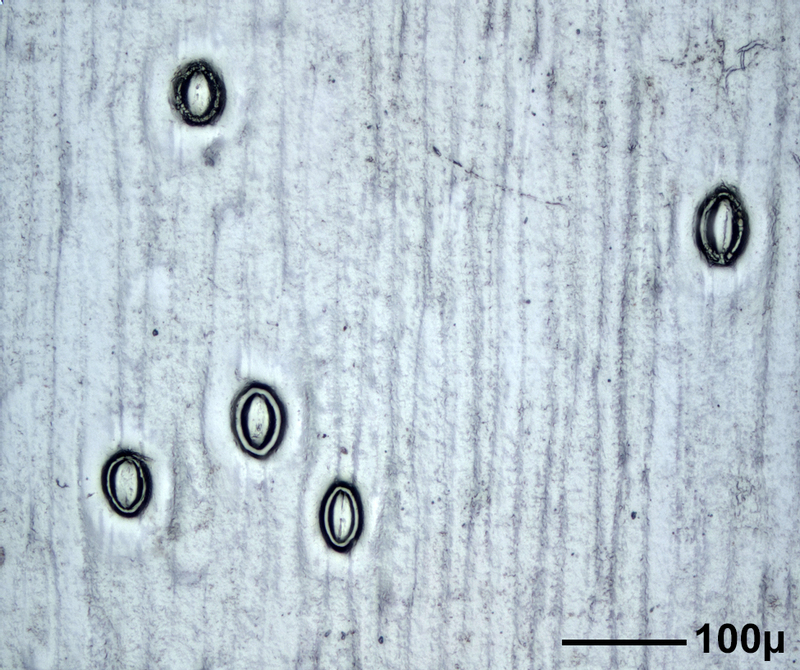 Image width is approximately 220 microns. 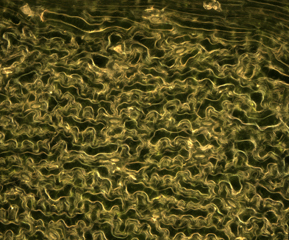 This is a 1.3 hour time-lapse video of closing stomata on a Veltheimia leaf. 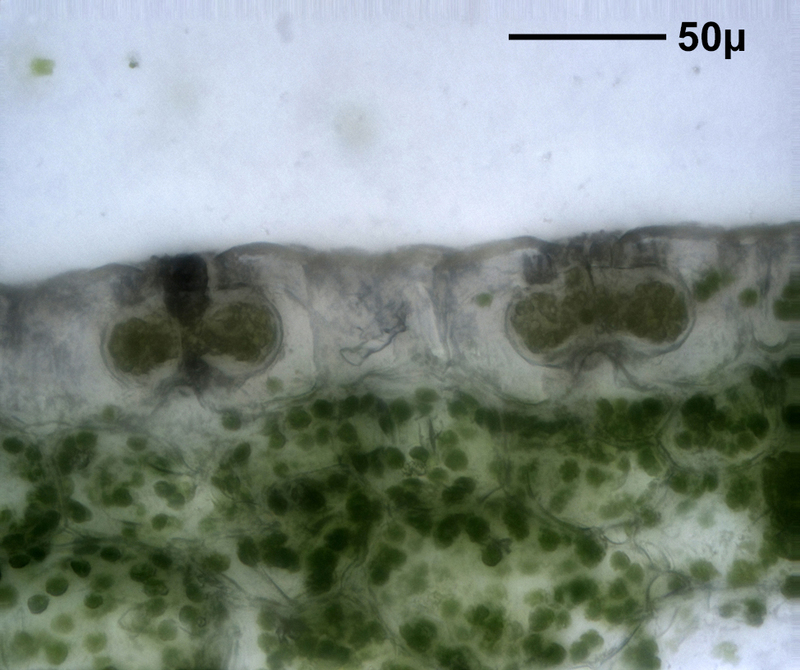 with red and blue illuminations of 250 and 100 µmol/m2·sec. The sequence reverses half way through the video. 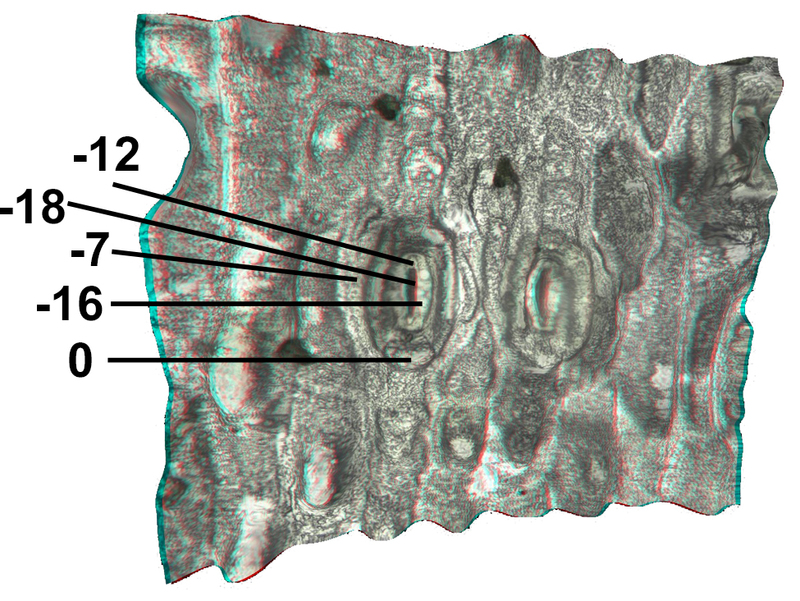 The right-hand image is an orthogonal view indicating heights of various features above the leaf surface. 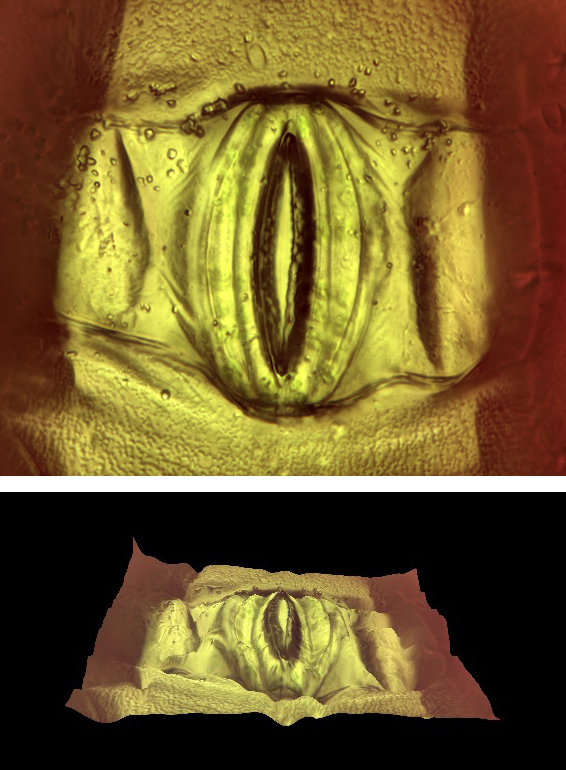 The center image is a 10 minute time-lapse video of closing stomata on a Vetch sativa leaf. The sequence reverses half way through the video. 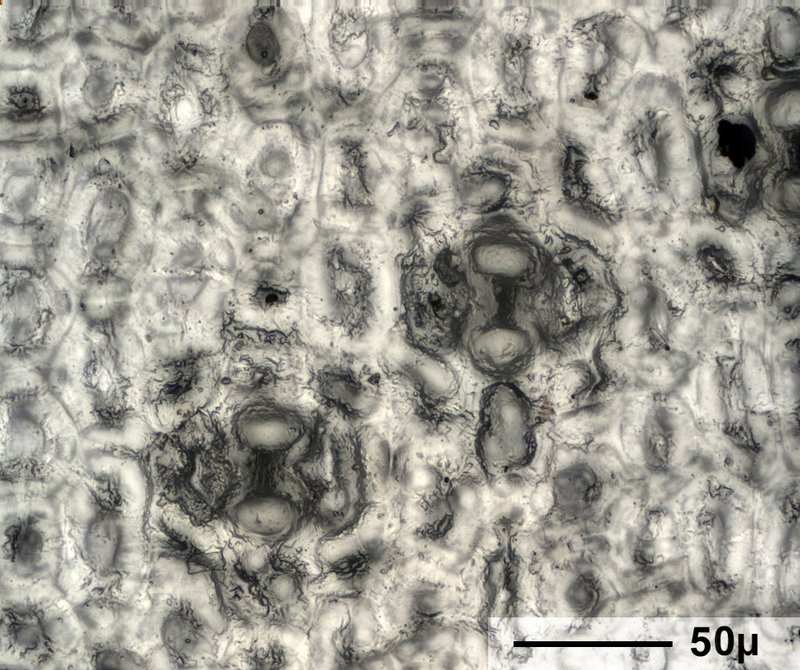 The right-hand image is an episcopally illuminated dark field view of the leaf underside showing vascularity connecting with stomata. 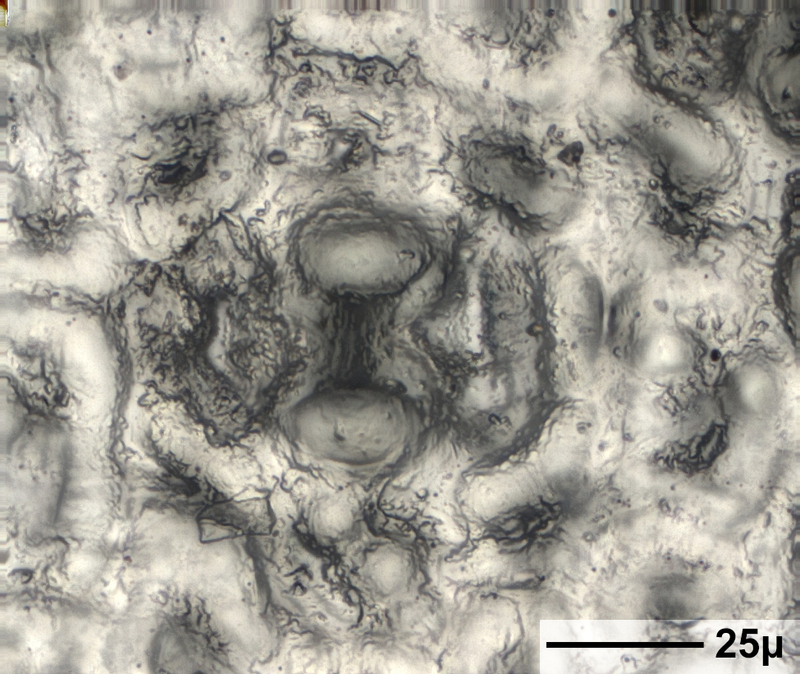 Width of the center image is approximately 220 microns. 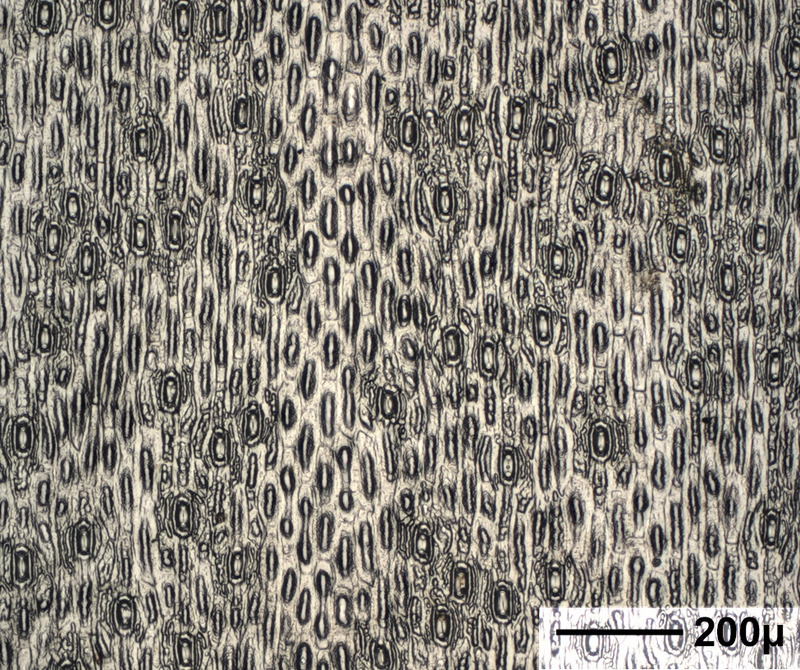 Width of the right-hand image is 620 microns. 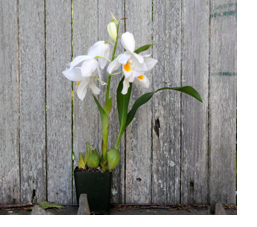 Click on the right-hand image to enlarge it. 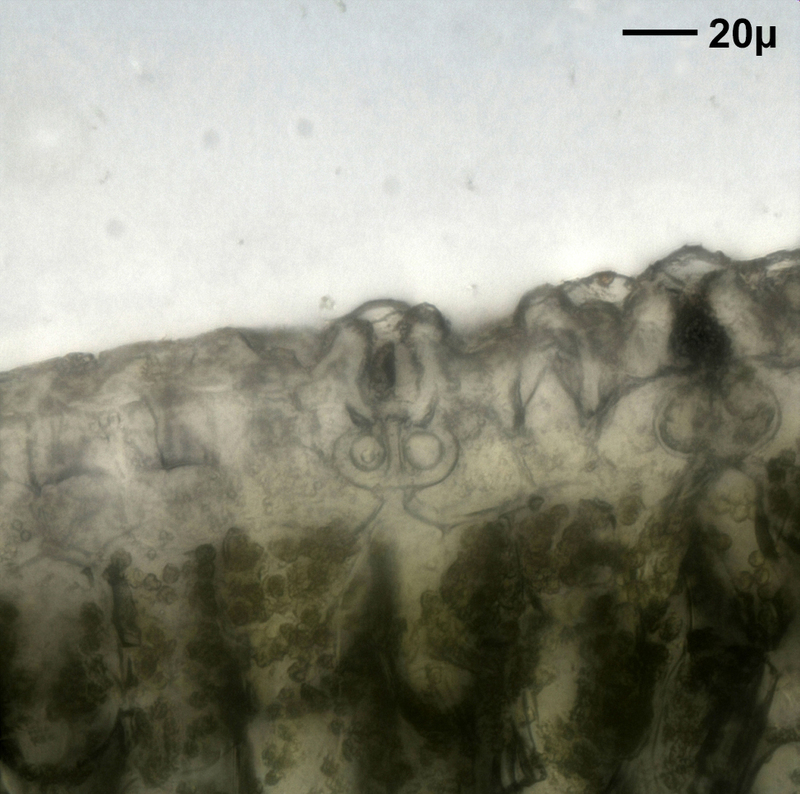 This sequence shows the closing of a stoma on a Tradescantia leaf. 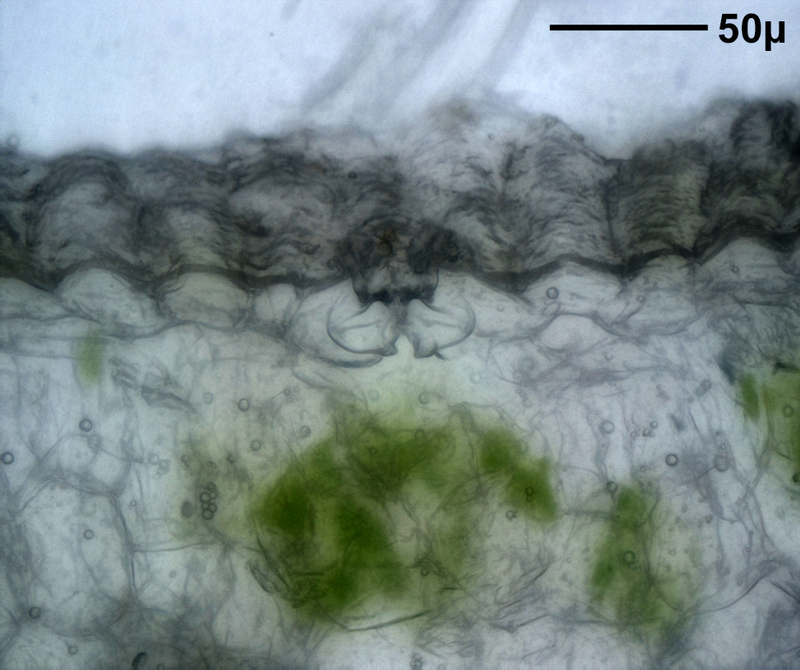 The leaf was removed from a plant and images of a stoma were taken at 0, 10, and 60 minutes. 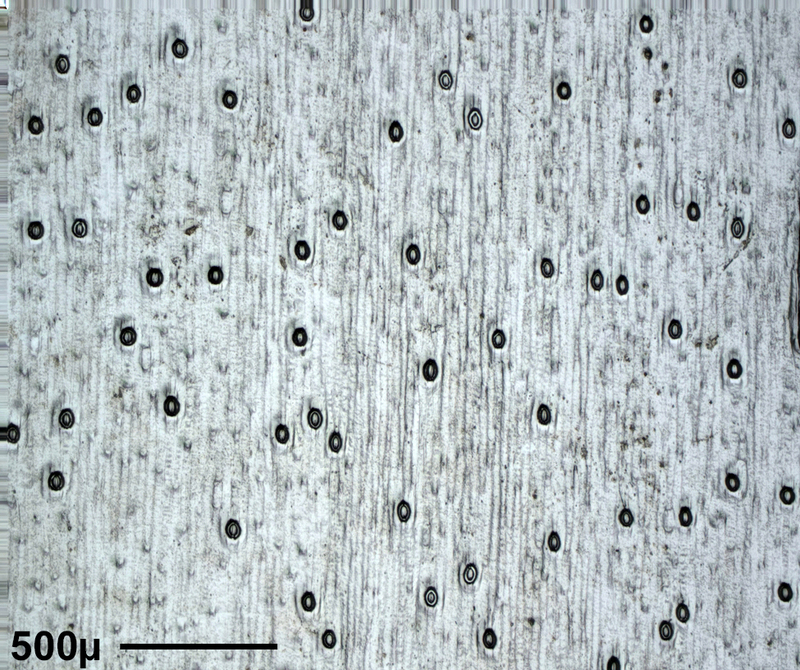 The top row shows plan views, the second and third rows show oblique views. 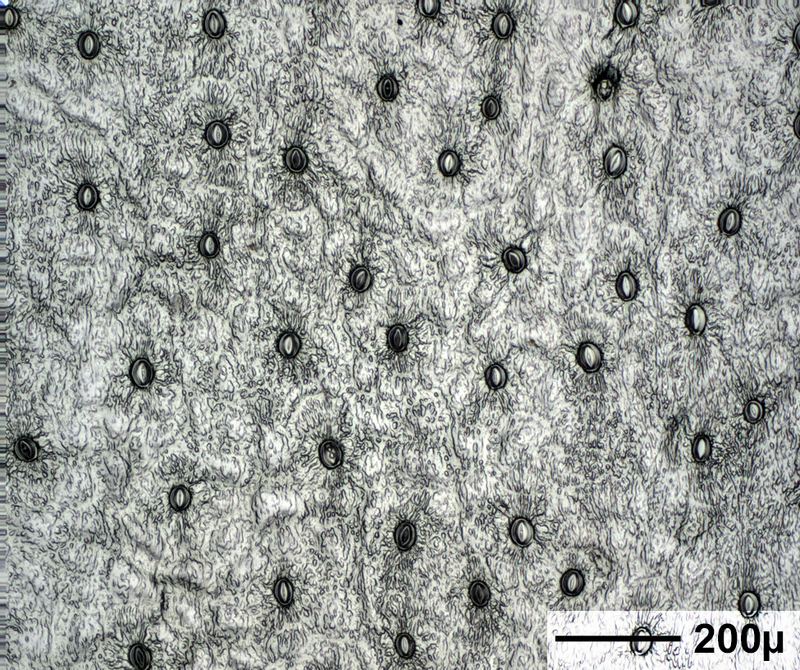 Image width in the top row is about 220 microns. 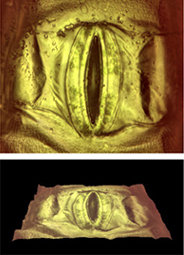 This sequence shows plan and oblique views of the closing of a stoma on a Tradescantia leaf. 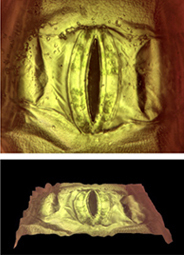 The leaf was removed from a plant and images of a stoma were taken at 4 minute intervals. 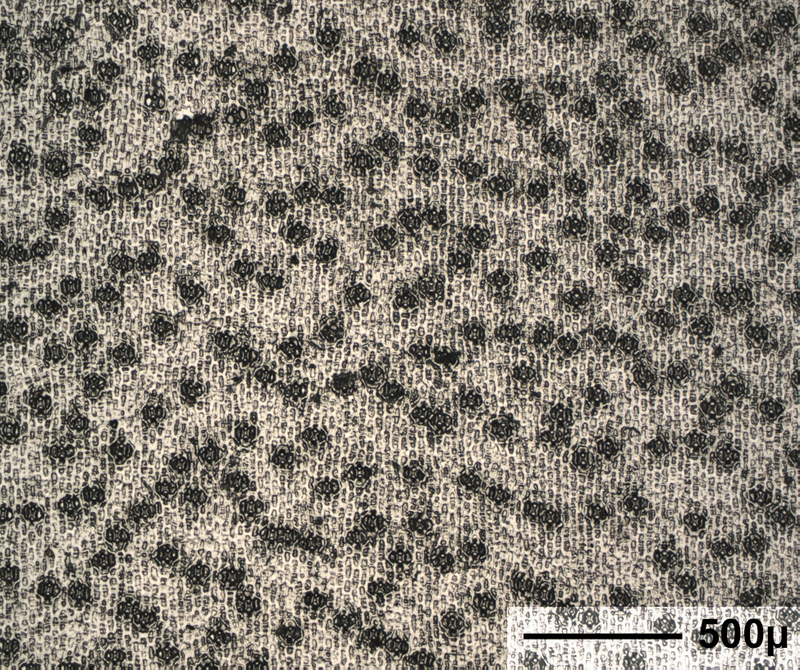 Image width in the top row is about 120 microns.